If you think this post is going to be a deep metaphor for how to handle the trials and tribulations of life… you’ve given me too much credit. I literally meant the title of this post to be “When you fall” as in… down on your face. Also not a metaphor. On Sunday afternoon after watching Mike run the Army 10 Miler, having brunch on Clarendon and going grocery shopping, I finally went out on MY long run. I left the apartment and headed over towards the Custis Trail. The last time I ran on Custis was at the beginning of an 18 mile training run for the marathon, and I inexplicably cried for the first three miles. That’s right, just big crocodile tears of emotion rolling down my face while ticking away my training miles. I’ve never claimed to be an emotionally stable individual. I decided it was time for me and Custis Trail to make up. It’s easily accessible, and it’s got a lot of great rolling hills. I didn’t have a ton of a time (I was going between 8 – 10 miles) so I wanted to make it as challenging as possible. I hopped on the trail and took it all the way down Route 66 to where Custis meets the Washington & Old Dominion Trail. I had only gone 4 miles to my displeasure (I swear the last time I did this it seemed like it was 1000 miles long). I turned around and headed back home thinking I’d tack on a mile or so once I got back to my hood. And then it happened. I tripped on an uneven piece of pavement and I went down… hard. I had so much forward inertia going I didn’t even get a foot in front of me to break my fall. I did the dumbest thing possible and stuck my hands out to break my fall. I literally barrel rolled over my head off the paved trail into the grass. I definitely screamed a bad word… I’m SORRY it was a reflex I couldn’t help it. I sat up in the grass, took off my headphones, and surveyed the damage. Thankfully I was wearing running tights, so even though I could tell my knees / shins had gotten hit really hard, they weren’t bleeding. 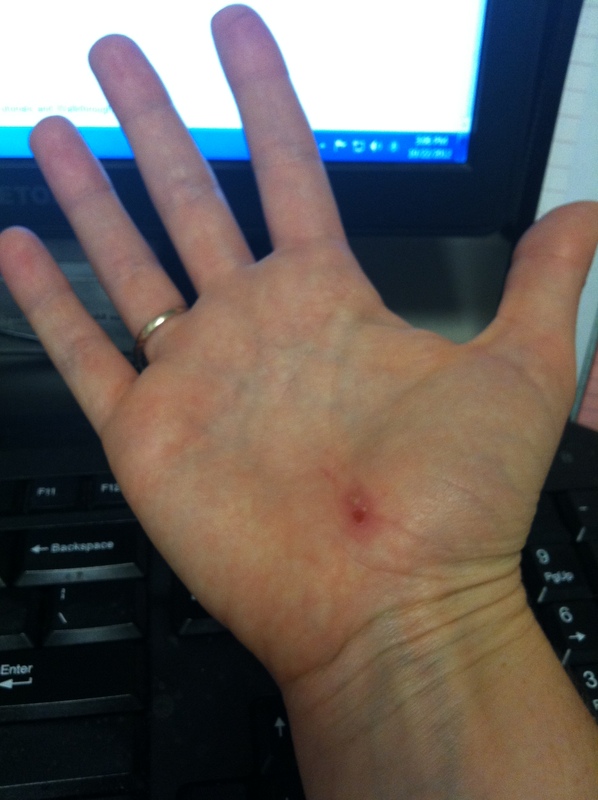 My hands were another story… they were in fact bleeding. I only had 2 bottles on my water belt, but I sacrificed the end of one bottle to wash the dirt off my cuts. Picture evidence of my mortal injury. Ok ok I know it doesn’t look that bad right now but I swear it really hurt! Mercifully, I was beat up and bruised, but I hadn’t actually injured myself. This was a big win especially when you consider I was 4 miles from home, and hadn’t brought money or my cell phone (I know I’m like a big walking advertisement for how to die while running). I sat in the grass for a minute or so and contemplated my predicament. I really only had one option. As much as I wanted to just go home and sulk, I wanted to get at least 8 miles in, and I was really far from home. So I sucked it up, stood up, dusted myself off, and took off running for home. I figured at least the burning sensation in my hands would distract me enough to make the miles pass quickly. When I got home (totally didn’t add on that extra mile at the end but hey let’s not get picky here), I was really proud of myself for not giving up. I feel like in the last couple months, there’s been a lot of giving up on the running front. No more! So when you fall… be a warrior. Put on your big girl (or boy) pants and finish the run. Obstacles only make reaching your goal that much sweeter 🙂 Happy Monday. Register for a spring marathon and get a training plan – I did chose the marathon but haven’t registered yet (I have until October 31st before the price goes up again!!). Also Mike bought the new Hanson Method Book on Amazon so I want to read a bit more but I’m pretty sure that’s what I am going with! Develop a home yoga practice – This hasn’t happened yet. But would you believe me if I said I actually planned on doing yoga when I got home tonight?? With moving, I only now feel like I’m back in a routine. I’m running Monday, Wednesday, Friday, and Saturday right now, strength training / cardio on Tuesday, Thursday and SOMETIMES Sunday. I need to work the yoga back in though. Become a morning exerciser (and stick to it!) – I’m making some progress!! I’ve started exercising a couple mornings a week and I’m hoping to gradually up that to every morning. I went to the gym this AM! Yesterday I made the decision to sleep in / run after work and I wasn’t pleased with that choice. It was SO hard to motivate myself to run (once I was actually running, I was fine… weird how that works). All I kept thinking was “I should’ve just done this in the morning” soooo you know… progress! Floss four times per week – I was thinking yesterday about this actually. There is such a strong link between oral health and overall health that I should stop thinking this is such a chore. It’s just like eating healthy and exercising… it’s good for me! I bought disposable flossers which I love so that’s helping. I also bought pre-threaded floss (thread already connected with the floss, not just the threaders) but the stick is too big to fit between some of my teeth. I might have to go back to the threaders, even though it’s more of a pain. Anyways… it’s going. I’m not at 4x per week yet, but I’m on my way! Make more running dates with friends and learn to love the running club. Also, try at least one new running group – I have had a running date and I’ve tried a couple other times with some girls (we couldn’t make our schedules work unfortunately). Haven’t been to the group because we’ve been so busy with the move. But I do have a plan to go to the group next weekend and to go to track sessions with Mike on Wednesdays again! That’s a start! I think in general, I wanted to get my running groove back with this goal and that is DEFINITELY happening. I still do want to try a group fun run. Either Pacers in Clarendon (they have a Ladies Run on Mondays or a co-ed run on Thursdays) or Lululemon in Clarendon (they have a fun run on Mondays). Stick to the budget (NO SHOPPING) – Doing SO GOOD on this one. Totally sticking to the budget even with the move. No shopping at all… go me, go me! I’m having fun reinventing pieces that are already in my closet. I also purged my closet a lot when I moved, so that felt really good. Made a huge clothing donation. Take a day trip to Kings Dominion – Going on Saturday for a special day date with Mike!! Woohoo!! Probably going to be a post too… Mike and I forgot to have a September Date Night, so we have to make up for it in October. Master a new cooking skill – I’ve decided it’s going to be homemade pasta. I looked up directions and all I need is a rolling pin (I know it’s shameful I don’t have a rolling pin but I’ve never had a surface large enough to roll anything). Hoping to get a collaboration with my brother where he does sauce / meatballs and I do that pasta and we have a big dinner! Perhaps I’ll try and get this on the calendar for next Sunday at Marine Corps Marathon. Go to as least three free fun / social events in DC or VA – We went to the Adams Morgan Day Festival which was really fun! I also volunteered for Ragnar which I was kind of counting as a “free event” since I was giving my time as opposed to spending money! We’re also going out for the Army 10 Miler this weekend and the Marine Corps Marathon next weekend (might be working at a water stop with the running club too). I could do better on finding non-running related events though. Someone invited me to go see the girl from Smitten Kitchen at Politics and Prose… so that counts right?? Maybe I’ll try to do one more non-running related fun free event! Research and consider adult Spanish language classes – A friend told me about some great educational podcasts so I think I’m going to try those. I need to load them on my phone or iPod to listen to on my new metro commute! Register for a spring marathon and get a training plan – that’s right! Making the plunge to run another marathon. I am thinking probably the Rock’n’Roll USA right here in my home city! I am also thinking about a very different training method… the Hanson Plan! More on that later! Try rock climbing – this was on Mike’s summer list and we never got around to it but I really want to try this. It looks really cool but we’ll have to be careful how we fit this in the budget. Develop a home yoga practice – As part of “Operation Spend Less Money” I need to start making some tough cuts. I have to cancel my membership at my current studio with my impending move, so I’m hoping to use this opportunity to develop a home practice which is… you guessed it… FREE. Become a morning exerciser (and stick to it!) – This is just something I think I need to start doing to prepare myself for the rest of my life. I am committed to exercise / fitness / and RUNNING so I think this is a good move for me. I like getting up early, now I just have to get myself out the door. Floss four times per week – This makes me sound gross but seriously I have excellent oral hygiene habits! The only problem is I have bonded retainers on the insides of my teeth so flossing is a PAIN (I have to use those special threader things). I don’t do it as often as I should so I figured a solid goal was a good start. Make more running dates with friends and learn to love the running club. Also, try at least one new running group – Since this summer I’ve been in kind of a rut with running. I can feel myself slowly starting to claw my way out of it and I’m really excited to attack it full force this fall. If you need me? I’ll be running. But I also need to get over some lingering insecurities I have about running. For that, I’ve gotta learn to love the group. Try a barre class – I always thought these classes looked fun but they are expensive as all get out in DC. $25 for a single class????? Surely you jest. But I saw online that Lululemon in Arlington is offering a free barre class on Friday evenings. I’m hoping to check that out. Go to NYC to visit friends – Didn’t do it this summer… need to do it this fall. Right now I’m planning to go up for the weekend of the NYC Marathon! Stick to the budget (NO SHOPPING) – I have developed quite a nasty shopping habit over the course of my existence (I will not apologize for my love of shoes). I don’t need anymore clothes or shoes… I need to stick to my budget. Take a day trip to Kings Dominion – Mike really wanted to do this over the summer and we just couldn’t make it happen for him. I really want to make sure we do this in the fall for him! Finish Anna Karenina before the movie comes out (and then go see the movie with Sarah K) – This book is long as hell. I’m reading it on my Kindle and I have read 233 Kindle pages. Do you know how many there are total? OVER 13,000!!!!!!! Just confirmed on Wikipedia, the actual text is 864 pages. But it’s pretty good so far. As long as I can keep all the Russian names straight I think this is gonna be fun. Plus there’s movie popcorn at the end of the road here. I ❤ popcorn. Master a new cooking skill – Don’t know what yet… but it’s time I start tackling some tougher stuff in the kitchen. Plus with my new kitchen, I’ll have so much more space to play!!! Go to as least three free fun / social events in DC or VA – Sticking with Operation Spend Less Money on this one. There is so much going on in DC. I just don’t take the time to research / find out about stuff ahead of time. Research and consider adult Spanish language classes – I used to be extremely proficient in Spanish (I might not go all the way to fluent but I was pretty close!) I haven’t used it in years though and it really is such an important skill to have. I’d love to find an adult class I can take to brush up on my skills (especially conversational skills) We’ll see if it fits in the budget though.